Some people think it tastes like Christmas. Others think it tastes like lemon Pine-Sol. 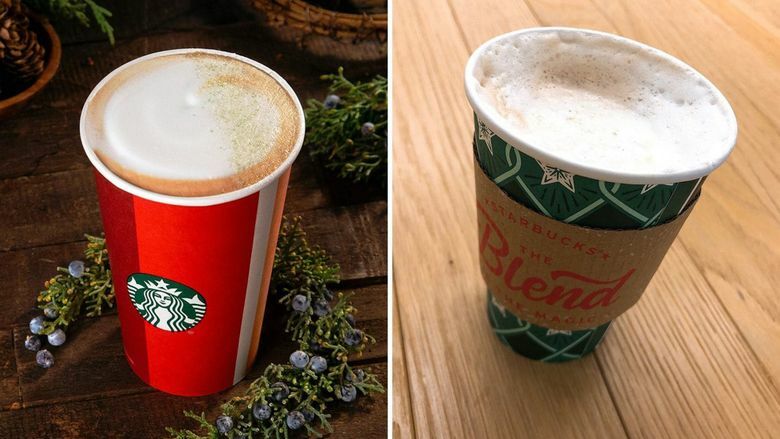 I know that Starbucks’s new juniper latte is supposed to be a holiday drink, conjuring up images of snow-dusted boughs and the crisp, herbal scent of pine. But you know what juniper is really intended for? Gin, delicious gin. Therefore, the debut of this beverage — available in coffee shops nationwide for a limited time — raised a lot of questions. Like: What does juniper taste like? Does the flavor of gin go with coffee? Does the flavor of gin go with steamed milk? Will this drink taste like a mouthful of pine needles? Can I just … put gin in my coffee? Coffee mixes very well with certain boozy flavors (I see you, disgruntled office worker with your thermos full of — *wink* — cold brew). They tend to be brown liqueurs: Bailey’s, amaretto, Frangelico, Kahlua. You can do an espresso martini with vodka if you’re feeling the whole ’90s comeback lately. Gin, with its herbaceous and complex flavor, does not tend to make the list of alcohol that pairs well with coffee. The Starbucks drink doesn’t contain booze, of course, but the juniper berry is the main flavor of gin. Piney with a hint of citrus, it’s a highly divisive flavor: Some people think it’s subtle, botanical, sophisticated and perfect, and some people think it tastes like forest shrubbery. They’re both right. Starbucks puts juniper syrup in its latte — but we don’t know whether there’s actual juniper in it, because the main ingredient after sugar is “natural flavors.” It’s dusted with a “pine citrus sugar” — another “natural flavors” ingredient — that gets its green pine color from spirulina, or algae. Either our local Starbucks had a light pour on the juniper syrup, or the delicate flavor is completely overpowered by the coffee. I did not get “an evergreen aroma and citrus notes,” as the press release boasts, which is maybe a good thing, because that sounds kinda like lemon Pine-Sol? Anyway. There’s a hint of barely perceptible pineyness in the drink that translates more as bitterness. It is not overly sweetened, which is the problem with 99 percent of Starbucks’s seasonal drinks. You get juniper more in the aftertaste, which lingers for a while — the sweet and bitter tongue-coating viscosity of one too many gin and tonics. Take coffee, add gin, subtract fun. It’s not bad, but I can’t say that it gives you the holly-jolly evergreen bough scent that makes it a holiday drink. As for the last question: Yes, you can put gin in coffee. Maybe in the form of a honeyed coffee gin and tonic, or a coffee negroni, or a cold-brew gin and tonic — but, sorry, they’re all summer drinks. Love how Starbucks has started casually advertising a juniper latte as if anyone normal person (me) knows what juniper tastes like!